In this food tour you will learn about our meals and taste our delicious empanadas, steak, dulce de leche gelato and Malbec wine. This is not a gourmet tour. I will take you where “porteños” (people who are from Buenos Aires) go and in this way you will be able to feel the local atmosphere of Buenos Aires. We will meet at the corner of Defensa and Humberto Primo (Starbucks). 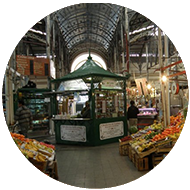 And from there we will visit indoor San Telmo Market, we will see the many antique shops in the area, Dorrego Square. On our way we will have some stops where we will be able to try some of the most representative food of Argentina. We will finish our tour at the Public University of Engineering.